Wow! Here comes the Virtual Gift Box and Everyone Gets A Prize with any FireFly ticket purchase. Well I don’t mind travel more often within these two months because I am thrill and excited to win something such as flight, vouchers and many more. 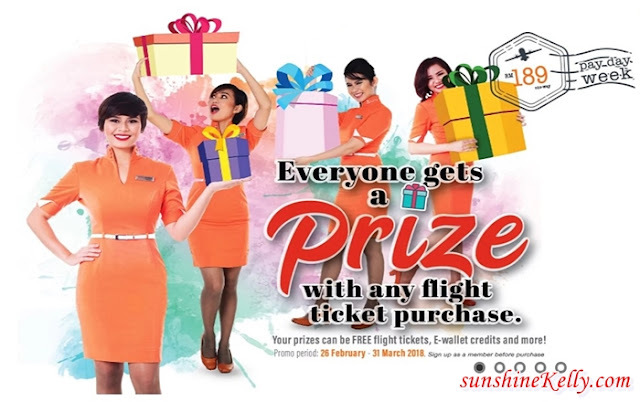 ‘Everyone Gets A Prize’ campaign which starts today and ends on 31st March 2018, leaves no one behind as every ticket purchase made via Firefly website will get a chance to randomly click open a virtual gift box and receive prizes like a FREE one-way flight ticket, RM50 E-wallet voucher, RM50 Firefly online store voucher or Firefly Holiday online voucher. Having just launched FY is For You, ‘Everyone Gets A Prize’ campaign falls under FY Appreciates. Traveling aside, Firefly is an airline that is all about being there for passengers. This will carry substantial segment marketing such as FY Convenience, FY Benefit, FY Opportunity covering Business To Business (B2B) and FY Action, Enjoyment, FY Engagement, FY Info covering Business To Consumer (B2C). B2B’s main focus will be on aircraft advertising, C-wallet corporate packages, partnerships and collaborations. Whereas, B2C will focus on campaigns & promotions, value added services, viral videos on social media, contest and media releases. For more information about Virtual Gift Box, Everyone Gets A Prize With Any FireFly Ticket Purchase, please visit FireFly Website, Facebook and Instagram.